I wanted to remember every single detail about the night that Donald Trump became President of the United States. I remember furiously unwrapping piece after piece of chili tamarind candy- my pile of tamarind seeds growing as rapidly as the poll numbers turned red. I remember refreshing the page constantly, my mouth blistering from all the chili salt. I remember leaping up from the table, digging frantically through my wardrobe for my green card, relieved to find it nestled between expired insurance paperwork and an ex-girlfriend’s letters. I remember gripping onto it keenly for the rest of the night- a talisman of hope and horror. I remember crying myself to sleep as the United States presidency was won by a man whose politics or lack thereof actively attacked my rights and existence, and those of just about everyone that I loved. I remember waking up the next morning, dreaming about tamarind seeds- how far they must have traveled to get to their pile on my dining table, from the JHC candy factory in Thailand to the aisles of Berkeley Bowl. Homesick and exhausted, looking hungrily for whatever tasted familiar- my hands reaching out, choosing the mouth puckering imli of my childhood with a small, tired smile. I spend the next week soaking the tamarind seeds, begging for them to sprout. I dream of a magical tamarind forest of resistance growing in my backyard- the immigrant urban farmer’s very own American dream. The seeds grow a fuzzy coat, they wrinkle up, they turn the water I’ve soaked them in a mucky and ominous green, they refuse to sprout. I come home to them every night, slipping off my backpack, dropping my clipper card onto my bed, and rushing to check on their progress- my spirits flagging as over a week of marching, chanting myself hoarse, and sleepwalking through emergency resistance meetings, I realize that my romantic dream of the tamarind trees that grew from the anxious night that Trump won the presidency will probably go unfulfilled. The Friday night that finally I throw out the seeds, the girl I’ve been chatting with on Tinder comes over, we hit it off and so begins the most dramatic relationship of my millennial soap opera. Falling in love in the limbo of awaiting Trump’s commencement is a haunted thing- doomed to fail, clinging on to each other anyhow, the intensity of it all almost comical. I drink more over the next three months than ever before- post-work beers putting me to sleep better than resistance meetings ever will. The Muslim Ban is announced and at this point I’m straight up unraveling. One night, I wake up at 3am dreaming of tamarind seeds again. I begin counting all the delicious foods that I grew up eating that have tamarind in them until I can fall asleep again- I count Lakshmi’s prawn curry, I count the tamarind candies on Jet Airways flights, I count the date tamarind chutney for pani puris, I count Neema Tai’s patrel. Counting sheep, diaspora edition. I find myself roaming the aisles of Vik’s more Saturdays than not, my car turning into the empty parking lot effortlessly, leading me there as if by accident. I find myself touching and impulse buying whatever feels familiar. My pantry is suddenly full of papads and bottles of hing I will never need. I buy huge quantities of frozen tamarind, intending on making enough tamarind date chutney to smother all my fears under, to pani puri away the loss. The package of tamarind stays unopened and slowly covers in freezer frost. I quit my job and fly home to Mumbai on February 17th 2017. After seven years of living abroad, this is my first one way ticket home. 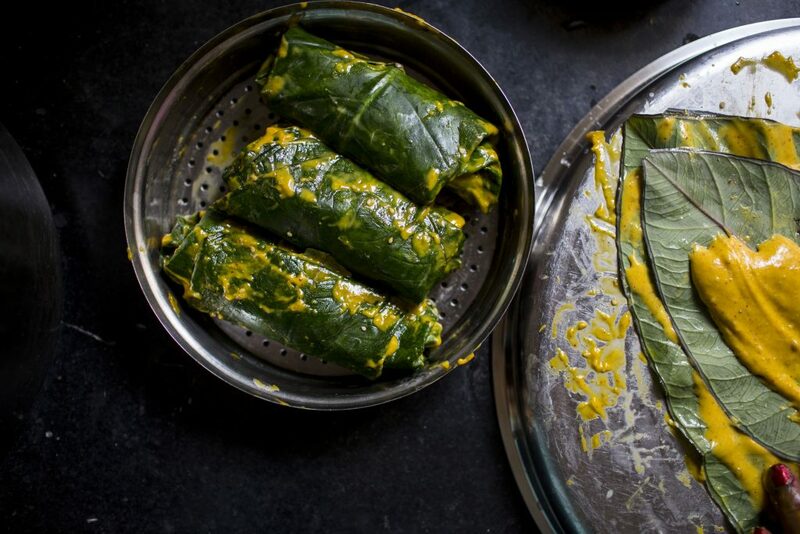 One of the first things I do when I get home is pester Neema Tai, my grandmother’s cook and the woman that fed my entire family, into teaching me how to make patrel- colocassia leaves layered with a spicy, sweet chickpea batter, rolled into a tight burrito, steamed until firm and then toasted in ghee- my most favorite Gujarati farsan. 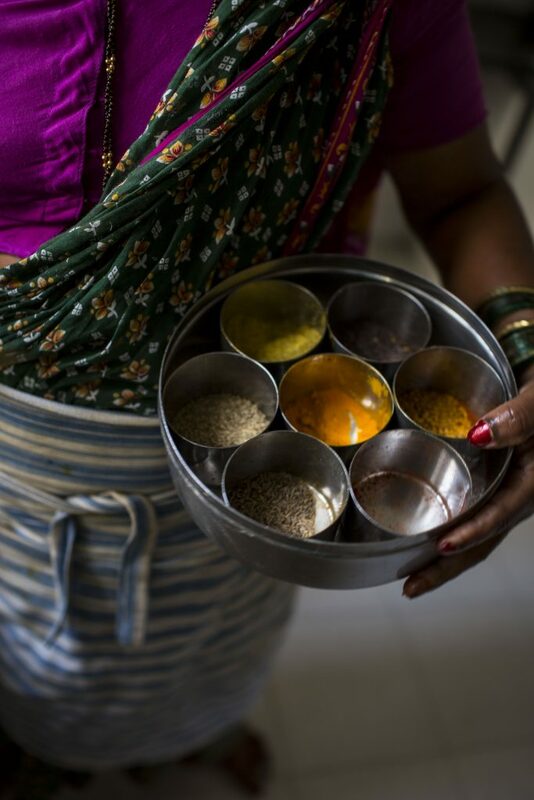 She hitches up her sari, tied Maharashtrian style between her legs, and begins vigorously mixing a handful of soaked, softened turmeric into a smooth batter- sweet jaggery, sour imli, bright yellow turmeric, a dash of red chili and a base of chickpea flour all coming together in a gorgeous golden froth. The brass mixing bowl clanging against her bangles feels like the sound I’ve been waiting for for years. I am finally home, and yet, I surprise myself with a wave of homesickness for Oakland. For the frozen tamarind block from Vik’s that I abandoned in the back of my fridge in my rush to pack up my life. For the seeds that never sprouted that probably made it into City Slicker’s compost pile, for the fact that this feeling of cooking in Neema Tai’s kitchen, in the home that I grew up in- everything about this feeling is beautiful and precious and magic, but it will always feel neither here nor there. Every moment of nostalgia for here, will translate into an even deeper nostalgia for there. I left Oakland because my mental health was derailing, because my back was literally broken, and most importantly, because I had lost sight of why I was in America, what idea of home I was even fighting for. I left America because so many people had told me to go back to where I came from, because I was so guilty of even having the privilege to go home, that I’d forgotten how to say, in six different languages, that this is my home too. Mumbai will always be my roots, and Neema Tai’s patrel will always taste like some kind of alchemy of motherland and ancestry. And I’m remembering, reminding myself, America will always be my home, and tamarind candy will always taste like the bittersweet union of immigrant dream, brown skinned reality, and a home worth fighting for. 1. Place a colocassia leaf with the vein side facing upwards on a clean dry surface and remove the vein and stem entirely using a sharp knife. Be careful not to tear the leaf. 2. Clean the colocassia leaf on both the sides using a wet muslin cloth. 1. 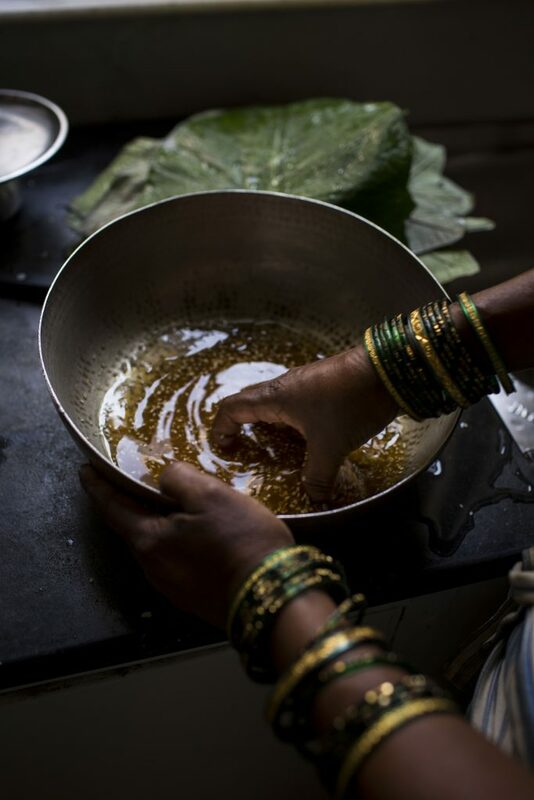 Combine all the ingredients together in a bowl, slowly add water, mixing with your hands or a whisk as you go until the jaggery melts and the mixture is smooth. Be careful not to add too much water, you want the mixture to be thick. Taste it, it should be sweet, salty and sour. If the taste of the flour is overpowering, add more seasoning. 1. Place a colocassia leaf on a clean flat surface with the de-veined side facing upwards and the tip of the leaf facing you. 2. 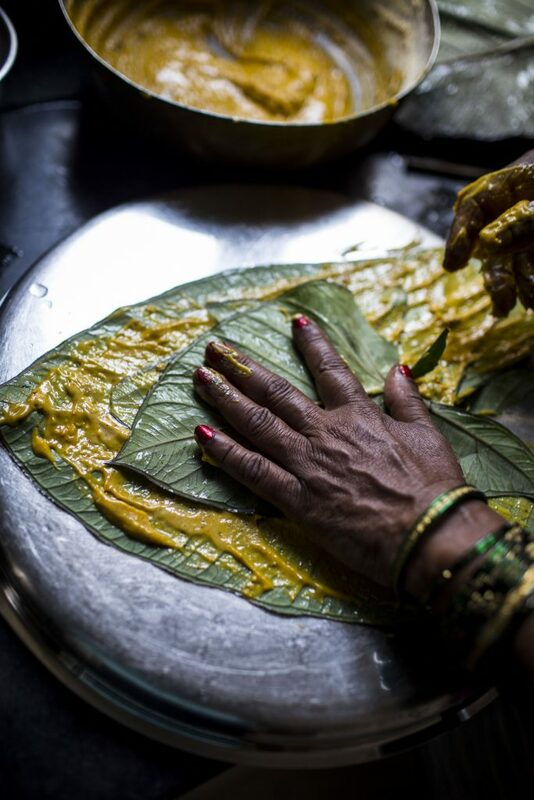 Spread a little besan mixture evenly on the leaf using your fingers. 3. Layer another leaf over it, this time with the tip of the leaf in the opposite direction, pointing away from you. Again spread your besan mixture evenly over the leaf. 4. Repeat with four or five leaves total, depending on the size and thickness of your leaves. 5. Now, like you would with a burrito, fold the leaves around 2” inward from both sides, left and right. 6. 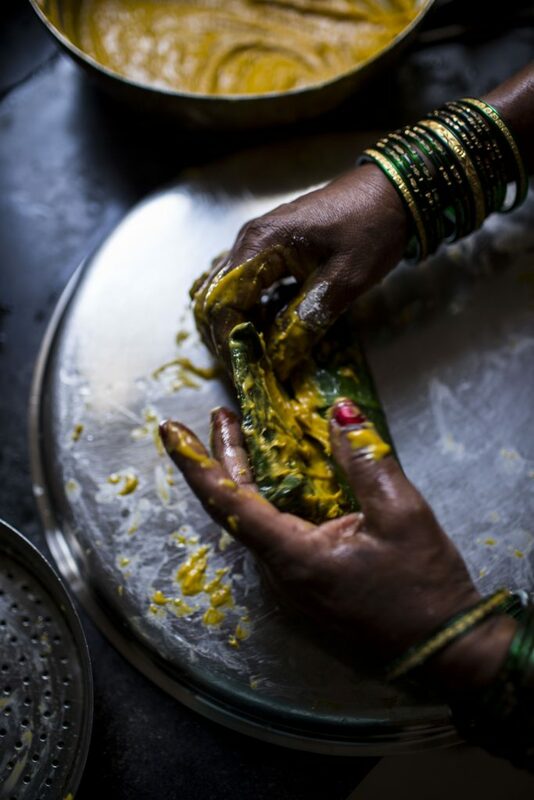 Once your ends are tucked in, roll your rectangle of layered leaves up tightly from top to bottom like a sushi roll, applying your besan mixture into each fold or crevice. You should have a cylindrical roll of sorts, with besan mixture oozing out of everywhere. 7. Repeat this entire process with all your leaves, until you have 3-4 patrel rolls, ready to be steamed. 8. Place all the roll in a steamer and cook for 20 to 25 minutes or until they are firm. Keep aside to cool completely for approx. 10 minutes. At this stage, you are welcome to stick your rolls in the freezer and save them for a dinner party, or future snack time. 9. If you’d like to eat them immediately – when cool, cut each cooked roll into 1/2 inch thick slices and keep aside. Gujrati cooked sushi rolls cross-sections, if you will. 10. Heat your oil of choice or ghee in a deep non-stick pan and add the mustard seeds. 11. When the seeds crackle, add the sesame seeds and asafoetida and sauté on a medium flame for a few seconds. 12. 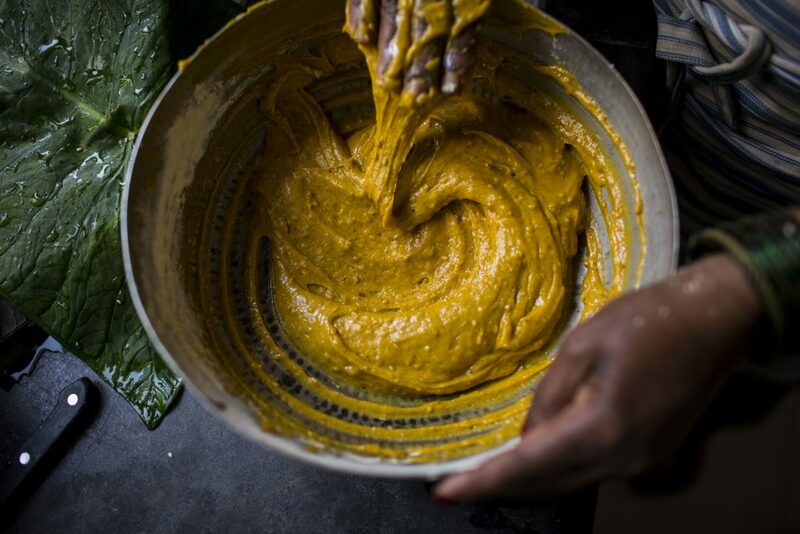 Add the patra pieces, being careful not to crowd your pan and cook on a medium flame until both sides are lightly browned. 13. Repeat with all your slices. 14. Garnish with coconut and cilantro. Serve!